Forum buddy's are members who have volunteered to help out other members (particularly new users). If you need help using the forum - perhaps your not sure where to post your question or you haven't had a reply they are there to help. Who are the forum buddys? Forum Buddy's usernames are bright green. You can see when they are online in the users online list at the bottom of the front page. What's a Forum Buddy's Job? Welcome new members in the intro section. Check for topics that aren't replied to or haven't been answered completely. If they don't know the answer, then to flag it up to others that do. Be a first point of call via PM or the help section for technical advice on using the forum features. Keeping an eye out to ensure new people are being looked after. Report any posts where a new user is not treated politely. The aim is to make new users feel welcome and help them find their way around. Last edited by Zoobec; 02-04-2019 at 10:38 PM. Last edited by mini lop1; 09-05-2014 at 09:29 PM. Well I'm Diane, the proud owner of Estelle and Frankie my rescue bunnies, and Peggy and Sorrell the guinea pigs who are also from rescues. I've owned bunnies since 1997 and have cared for many from the RSPCA, especially poor little bunnies with behavioural problems. 100% success rate!!! They've all gone from strength to strength. I'm.......middle aged resorting to be 35 some days or 85 on others!!! No I'm 50+. Married for 10 years to Bob my excellent hutch builder. I've no children of my own, but I do have 2 grown up step children.....and 3 step grand-children. I'm self employed and have run Hoppy Holidays in Pershore, Worcestershire since 2002. All self taught as my previous employment was working in a bank.....for 25 years!!! Very different. When I'm not busy caring for other peoples' animals, I love helping Alice at Windwhistle Warren. Fundraising is also a great passion of mine and help with the local branch of the RSPCA.....and of course Alice!! I love all animals....but especially rabbits!!!!! Well that's enough of me...................boring, yawn.....yawn!!!! I've been here for years (Too many to count!). Some of you might know me from past Secret Santa's and the RU Christmas Card & Birthday Card exchanges. Can't believe I was only 15 when I first became a buddy!! 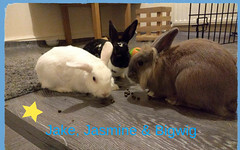 I now have a trio of bunnies, Jake, Jasmine and Bigwig who have been recently bonded. Bigwig was hand reared by myself with her siblings after being abandoned outside pets at home/the vets I used to work. I also have two rescue piggys - Ellie and Marcie, 2 rats - Negan and The Governor, and a rescue doggy named Jack who is a poodle X German Spitz.